Late spring white four-petaled racemes. 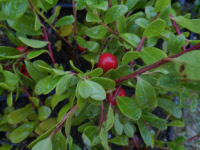 Care: Full sun well-drained soil, vigorous; cut back after flowering to make it full. Native: Southern Europe and Mediterranean. 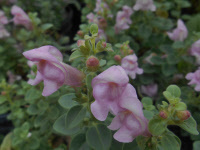 Size: Perfect for a dry border or rock garden. Drought tolerant. 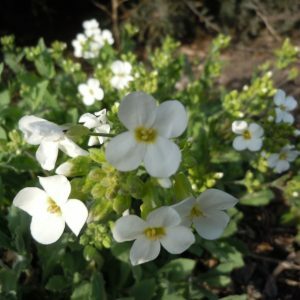 Arabis is Greek for Arabian. Cultivated in the U.S. since 1800’s. Perky white flowers mass over a mound of evergreen foliage, May – June. 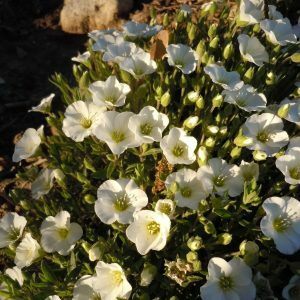 “…(A) very ornamental plant …(with) fine pure white and large flowers … the white flowers appear so thickly in early summer as to obscure the foliage.” Alpine Flowers for English Gardens 1911. Care: sun to part shade in well-drained soil, shallow rooted so needs occasional water. Awards: England’s Royal Horticultural Society Award of Merit.